This project is part of TU Dresden's Institutional Strategy, funded by the "Excellence initiative of the German Federal and State Governments". July 28 th to August 2 nd , of 2019 in Dresden, Germany. Aim: The conference is meant to provide an informal platform for scientific exchange between established scientists and younger researchers in the fields related to chemosensation. In addition, it is meant to provide participants with up-to-date knowledge on various aspects of the human chemical senses not only through seminars - there will be a strong focus on practical demonstrations and experiments (see program). Location: It will be organized through the Smell & Taste Clinic of the Department of Otorhinolaryngology of the University of Dresden Medical School, Fetscherstrasse 74, 01307 Dresden, Germany, phone +49-351-458-4189. 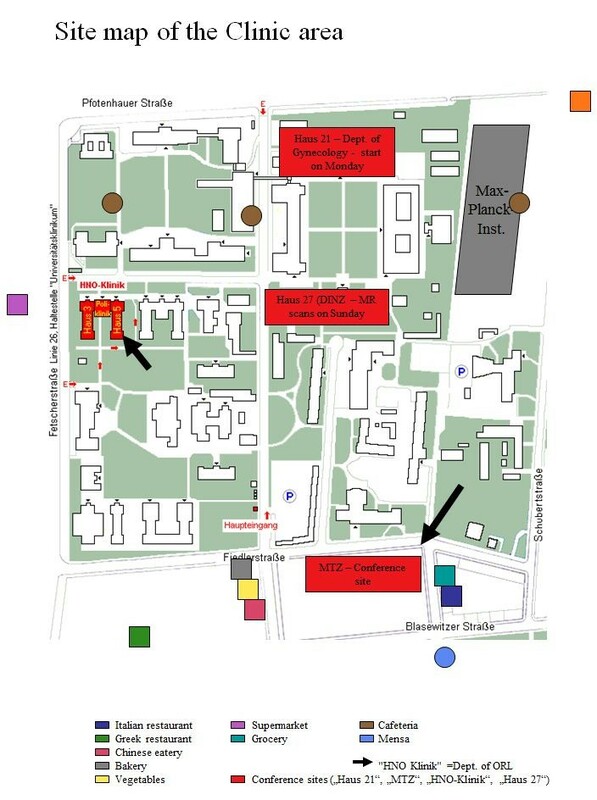 The meeting will start at the lecture hall/vicinities ("Hörsaal") of house number 19 at the area of the University Clinic Dresden, House number 21, and later continue at the Departement of Otorhinolayrnygology (house number 5). Fee for participation is 330 Euro ( for details please click here ) . Participants with an industrial background pay 1000 Euro. This fee covers conference dinner at Schloss Eckberg , a barbecue, and an excursion to the surroundings of Dresden. The number of applicants will be limited to 32. Sunday afternoon (28 th of July) there will also be a chance to join a guided city tour through Dresden (it is free). It starts at 1 p.m. at the guesthouse at Gutenbergstrasse 6, 01307 Dresden, and it will end at University Clinic, Department of Neuroradiology, Haus 27, MRI I. Also, Sunday afternoon, between 3.30 and 6.30 p.m. you have a chance to visit the University Clinic, Department of Neuroradiology, Haus 27 (DINZ), MRI, to join us in order to get structural images of your brain/olfactory bulb (this is also free). Please let Thomas Hummel know in advance whether you would like to participate in either event. The meeting will start with short 5-min presentations from every participant. For housing please contact Mrs. Schoenborn, phone +49-351-4445-60 or a.schoenborn@sbgdd.de . We booked rooms for participants at a guesthouse (Sächsische Bildungsgesellschaft für Umweltschutz und Chemieberufe Dresden mbH, Gutenbergstraße 6, 01307 Dresden) very close to the Clinic, and where we also receive a special rate of 47 Euro per night (including breakfast). It is planned that all participants will stay at this place. Deadline for registration was the 1st of June 2019 . Continuing medical education: Participation in all aspects of the meeting will get you 45 points (Category C). Please contact Thomas Hummel for details. In addition to the demonstrations/experiments given by/performed together with each of the lecturers, among others there will be practical demonstrations of endoscopy of the nasal cavity , rhinomanometry, blood flow, acoustic rhinometry, recordings of electro-olfactograms, recordings of event-related potentials, and clinical aspects of olfactory dysfunction (diagnosis, treatment). The talk and demonstration will include theoretical and methodological aspects in the assessment of life-span changes in chemosensory functioning. One important issue concerns cross-sectional vs longitudinal assessment, advantages and disadvantages with the respective method (e.g., practice effects, costs, environmental confounders). Also, various aspects of olfactory cognitive processing will be highlighted. In particular, the relationship between various forms of odor memory and how they relate to the different memory systems will be addressed (e.g., the most simple forms of olfactory learning, conditioning as contrasted with the most complex form - episodic odor recognition). The theoretical part will be combined with a practical demonstration of behavioral assessment of episodic and semantic odor memory and how these two forms of memory are related. Discrimination of odors? or: why does it smell different ? Humans are capable of discriminating between an enormous number of odors. The question of how the olfactory system achieves this amazing ability is one of the central topics in olfactory research and is of both theoretical and practical interest. This lecture aims at giving an overview with regard to the present knowledge about the neural basis of odor discrimination, odor structure-activity relationships, the psychophysical methods used to measure discrimination performance, and comparative data on discriminability of structurally related odorants. Experiments performed by the participants shall illustrate the advantages and disadvantages of different methods and their influence on the outcome of odor discrimination tasks. This lecture will cover environmental chemosensory hypersensitivity from a broad perspective. In addition to sensory, cognitive and neural aspects of olfaction and chemosomatosensation, this topic will be approached by including aspects such as affect and personality. We will discuss various forms and diagnoses of this hypersensitivity, symptomology, quality of life, assessment, prevalence and co-prevalence with other types of environmental hypersensitivities and medically unexplained syndromes, risk factors, possible underlying mechanisms, and coping-strategies and social support. The study of perception has generated contrasted models of development where nativist and constructivist views oppose. Olfaction is no exception, but this talk will present data that reconcile both conflicting parties in showing that the odour environment strongly influences olfactory development from very early on, long before birth. Data will be presented on the structural development and functional onset of olfaction, on the developmental course of olfactory sensitivity and discriminative power, and on learning and memory processes. The performance of the sense of smell will be described in the context of issues of communication and adaption, emphasising evolved and learned perceptual predispositions. Experimental paradigms to investigate odour perception and cognition will be described in early human development with special emphasis on the numerous issues that remain to be resolved. Finally, the value of using animal models will be highlighted to test hypotheses that are raised in the human, or conversely to import new questions to the understanding of our own species. Olfactory cell biology in health and disease: methods and models. This lecture will cover the molecular and functional characteristics of olfactory receptor cells, provide insight into their developmental and cellular origins, present methods for assessing their function ex vivo and in vitro, and discuss how olfactory epithelial biopsies are becoming a tool for regenerative medicine. We will also examine signaling and regulatory pathways that may be impacted by medications, diseases and genetic disorders to assist the student in understanding how these factors may contribute to olfactory dysfunction. The lecture will give an overview on chemical communication in humans. Single topics will be: Why should animals communicate via chemosignals? 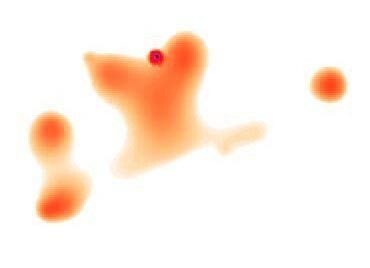 What are the characteristics of social chemosignals? How are social chemosignals produced? How are social chemosignals perceived? Are there human pheromones? How to study human chemosensory communication? Chemical signalling in humans? You will be given a short introduction of what is known about structure/function relationship in vertebrate olfaction and taste at both macroscopic and microscopic levels. In the anatomical dissection room you will be confronted with some organs and tissues such as a real hu m an brain and a dissected head, in which we will demonstrate the olfaction- and taste- relate d structures. Silvain Lacroix , M.D., Ph.D. The nose is an air conditioner and is involved in the protection of the lower airways against inhalation of exogenous particles and airborne irritants. The nasal mucosa is therefore densely innervated by sensory nerves containing several neuropeptides. In the airways, activation of sensory C and A delta fibres leads to the release of multiple neuropeptides. In addition to their involvement in vasodilatation and nasal airway obstruction, plasma protein exudation and mucus secretion, sensory neuropeptides also participate in inflammatory cell recruitment. This neurogenic inflammation contributes to the intensity of nasal blockage and subsequent olfaction disorders, rhinorrhea, and headaches, the most common symptoms in chronic rhinosinusitis. The concentration of pro-inflammatory sensory neuropeptides is increased in the nasal mucosa of patients suffering from chronic rhinosinusitis. In contrast, the activity of the enzymes involved in the degradation of these sensory neuropeptides is markedly reduced. These observations should contribute to a better understanding of the pathophysiological mechanisms of one of the most frequent chronic inflammatory diseases. Impairment of olfaction is a characteristic feature of many neurodegenerative diseases. This lecture summarizes the available information about olfactory function in distinct neurodegenerative conditions and possible therapeutic strategies. It indicates the advantageous use of olfactory testing as a contribution to early and differential diagnosis in Parkinson´s disease and Alzheimer´s dementia. Deficits in the sense of smell may precede clinical motor and cognitive symptoms by years and might be helpful in assessing the risk for developing these diseases in otherwise asymptomatic individuals. Numerous studies suggest that olfactory disturbances in Parkinson`s disease may have diagnostic utility for the differentiation from other movement disorders. Thomas Hummel, M.D. and Basile Landis, M.D. The chemical senses gustation and of olfaction are important not only for the detection of potential dangers such as fire or spoilt food, but also for the quality of life of human beings. In this article, we review the characteristics of the sense of smell and give a short overview about possible olfactory dysfunctions and their therapy. Odours result from the integration by our olfactory sense of a complex mixture of odorants. The lecture will cover the different levels of odour perception from the receptor to the “odour object” integration. Flavours result from the integration of odour objects, taste, trigeminal, visual, and auditory stimulations released during food consumption. Flavour is our mental representation of food. The final part of the lecture will present the theory about flavour perception and integration. When contemplating olfactory problems and questions, one has to bear in mind that not only cells are busy picking up olfactory cues using molecules dispersed in our environment, but that a whole organ is designed to that task besides helping with respiration: the nose. When the problem of olfactory loss in encountered, a thorough examination of the nose is necessary. During this demonstration, the nose will receive a closer look using rigid and flexible endoscopy technique. Special attention will be paid to the appearance of the vomeronasal duct, as well as to the nasoplatine duct. Major reasons of olfactory loss due to alterations of nasal conditions will be demonstrated. Attendants will have the chance to practise endoscopy to have a look at cavity that hosts the sensory system they deal with during this Summer School. This course will also provide an introduction of the current nasal function measurement techniques. The methods presented will be: anterior rhinomanometry, acoustic rhinometry, and Laser Doppler Flowmetry. The techniques will be discussed and a practical demonstration will be given. During this summerschool an introduction to olfactometry and gustometry will be given. This will consist of both, a more theoretical introduction to this are of research, and a hands-on, practical approach. Assessing olfactory and trigeminal function is a key aspect not only in a clinical context but also in olf a ctor y research. During the course different smell-tests will be demonstrated. The focus will be on the Sniffin Sticks test battery with its subtest for evaluating olfactory threshold, odor discrimination and odor identification, which can be experienced in this hands-on course . In addition two methods for assessing intranasal trigeminal function will be demonstrated. Electro-olfactogram (EOG) are local-field potentials generated in the olfactory epithelium in response to an olfactory stimulus providing neural information from the peripheral olfactory level. EOGs are commonly characterized by the response amplitude that is a negative peak denoted by N1 and by the response latency that relates to the time point of the amplitude (L1). During the practical course, it will be shown how to (i) prepare electrodes for recordings; (ii) localize the EOG recording site; (iii) administer odorous stimuli; (iv) visualize EOGs responses to odorants. Starting from known neuroanatomic correlates of olfaction, functional imaging methods will be introduced. The most widely used functional imaging method being MRI, we will concentrate on this modality. We will look at all steps of a fMRI-study, beginning with the methodological background, passing by the study-design, to finally interpret the results of the complex data analysis procedures. Besides the great advantage of good anatomical resolution, fMRI has a rather poor temporal resolution. Possible remedies for this problem will be discussed. EEG (Electroencephalography) is an electrophysiological method to record electrical activity of the brain, with a high temporal resolution. The brain processing of chemosensory perceptions could be measured and studied by the delivery of odors or taste solutions using olfactometers or gustometers. This practical course comprises the introduction to the principles of olfactometry and gustometry, demonstration of odor/taste stimulation and recording of event-related brain waves, and the time-frequency analytical method for olfactory EEG results. Specific applications of these measurements will also be discussed. How to get to the guesthouse at Gutenbergstrasse 6, 01307 Dresden, Germany?